Extremely rare signed card, even unsigned these hardly ever come to market. The card itself has a terrific image of Johnson following through after making a pitch. There are no creases or wrinkles, the surfaces and edges are clean, the back is nice as well. We feel the card grades Ex overall. Crucially, The Big Train signed this in fountain pen ink, the Walter is quite bold, the nson in Johnson is a touch light. The autograph nonetheless displays well and contrasts nicely against the clean card. 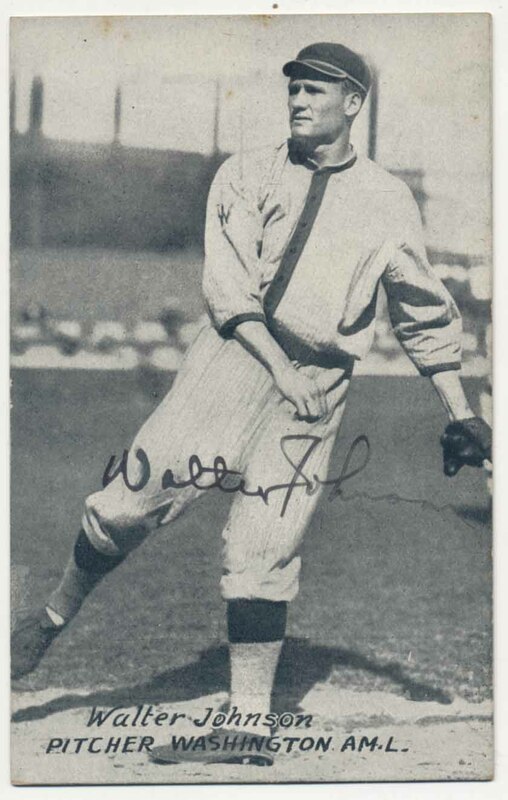 We know high-end autographed cards are white-hot right now, who wants to add this rare (and possibly) unique Walter Johnson signed 1920s card to their collection? Please note this came from the collection of a 25-year long customer of ours and a great hobbyist, there should be no issues with the signature given the provenance (this would have been purchased by this person 10-20 years ago). JSA LOA (full).